Origami comes from Japanese words “Oru” meaning “to fold” and “kami” meaning “paper”. That’s exactly what we do here. 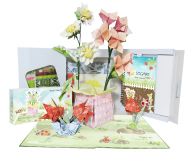 Our origami products teach you how to transforming the square paper to the animal, clothes and flower etc….